Are you looking for a fresh perspective on bathrooms? The artists and architects who first created the minimalist style were concerned with a variety of ethical and aesthetic ideas, but you don't need a degree in philosophy to appreciate the elegance of minimalist design. The elements are a lack of ornamentation, emphasis on geometric forms, and the use of industrial materials and fabrication methods. Minimalism isn't for everyone; however, there are good reasons for its popularity. It not only creates a calm and contemplative space, but it also ensures durable, long-lasting construction and easy cleaning. Most importantly, minimalist designs have a timeless appeal, independent of the whims of fashion. 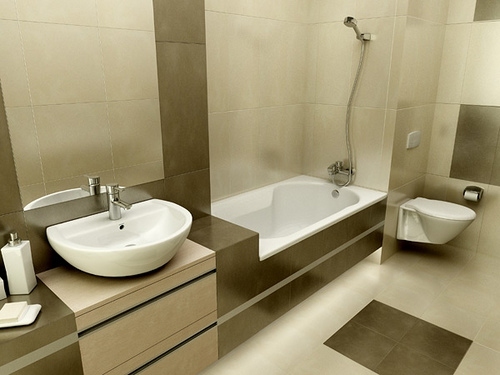 Here are some aspects of minimalist bathroom design ideas to consider. Some say that minimalism begins and ends with the "Empty White Room." That's a tough standard if you're designing a living space, but it's a good idea to keep in mind as you make basic decisions about your walls and floor. Although wallpaper is clearly inconsistent with minimalist purity, you'll find that white walls aren't as simple as they appear. Every home supply store stocks dozens of shades of white paint, ranging from cool to warm. Each shade has a specific effect on the ambience of the bathroom. If white walls really aren't working, then a viable alternative is wood paneling. Hardwood paneling is attractive, unobtrusive, durable, and mildew-resistant. Avoid drapery and achieve privacy with frosted glass. For a real industrial touch, use traditional glass blocks. Polished concrete is the usual choice for the minimalist floor. Concrete retains heat poorly and becomes slippery when wet. Simple ceramic or stone tile may be a more practical alternative. The minimalist designer will avoid chrome and plastic whenever possible. Stainless steel is the preferred material for plumbing fixtures, such as taps and faucets. Aluminum is a suitable material for light-duty hardware such as mirror clips, cabinet handles, and drawer pulls. Several popular design houses manufacture fixtures specifically for the minimalist aesthetic. These fixtures even include tankless toilets and faucetless sinks that reduce visual clutter. You may need to break the rules a little when you choose a bathtub. To reduce weight, some manufacturers produce minimalist bathtubs using synthetic materials; furthermore, a bathtub requires a more organic form than otherwise dictated by minimalist aesthetics. Still, the principles of simplicity, functionality, and symmetry apply to the choice of bathtub. Countertops and cabinets are often used to excellent decorative effect in ornamental design styles, but in a minimalist bathroom, these items should be understated or even eliminated. Polished stone and concrete are suitable for countertop applications, while clear-coated plywood and glass can be used for cabinetry. The minimalist is that less is more. If a design element seems unnecessary, get rid of it. Eliminating extraneous elements reduces the number of design decisions you'll have to make, but it increases the importance of each decision. Carefully consider the color, material, size, and location of everything. It will be easier if you choose 1 or 2 primary components for visual impact, such as a stone tile floor and a glassed-in shower stall. Then surround them with subdued, complementary elements.